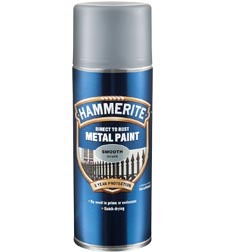 Hammerite Aerosol Metal Paint is specially formulated to perform as primer, undercoat and topcoat in one. It gives the metal a subtle hammered effect with a metallic sheen. Available in black, white and silver. Abrade smooth surfaces and remove all loose and flaking paint with a wire brush. Remove dirt and dust with diluted detergent. Remove grease with Hammerite Brush Cleaner & Thinners. Then rinse with clean water and allow time to dry. 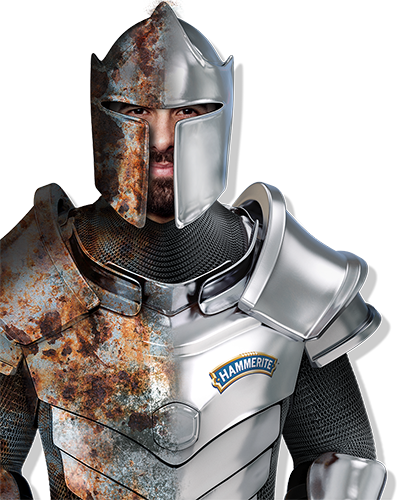 Spray a test patch of Hammerite Direct to Rust Metal Paint onto painted surfaces and leave for 1 hour. If there is no reaction apply Hammerite Direct to Rust Metal Paint directly to surface. 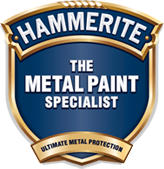 If there is a reaction remove all paint before applying Hammerite Direct to Rust Metal Paint. On bare zinc, aluminium and galvanised surfaces, apply Hammerite Special Metals Primer before applying Hammerite Direct to Rust Metal Paint. Store aerosol at room temperature for 2 hours prior to use. Shake can vigorously, in a vertical motion, until the agitator ball is heard and then for a further 3 minutes. Apply light even coats, from a distance of approximately 15cm (6 inches) and keep the aerosol moving. Do NOT concentrate spray in one spot. Apply 3-4 coats for maximum protection and allow 15 minutes between coats. Between coats invert can and spray for 2 seconds to avoid blockages. Touch dry 15 minutes, recoat after 15 minutes. How do I paint on heavily rusted metal surfaces? Remove all loose rust with a wire brush or coarse sandpaper and then clean the surface with brush cleaner & thinners. For best results apply Hammerite No.1 Rust Beater before painting with Hammerite Paint.